Michaelston-y-Fedw Community Council normally meets on the first Wednesday of each month (except August) at 7.30pm in the Village Hall. The next meeting will be on Wednesday 1st May 2019. Members of the public are welcome to attend. Minutes of Community Council meetings are available as downloadable PDF files from the list on the left of this page. Please note that the minutes of a meeting are only loaded onto this website after they have been signed off at the following meeting. The latest minutes currently available are for the meeting on the 6th March 2019. If you have any queries or comments for the Community Council you can contact the Clerk or you can see councillors' contact details using the link at the top left of this page. The village litter pick took place on Saturday 13th April. Thanks to everyone who came along to help. 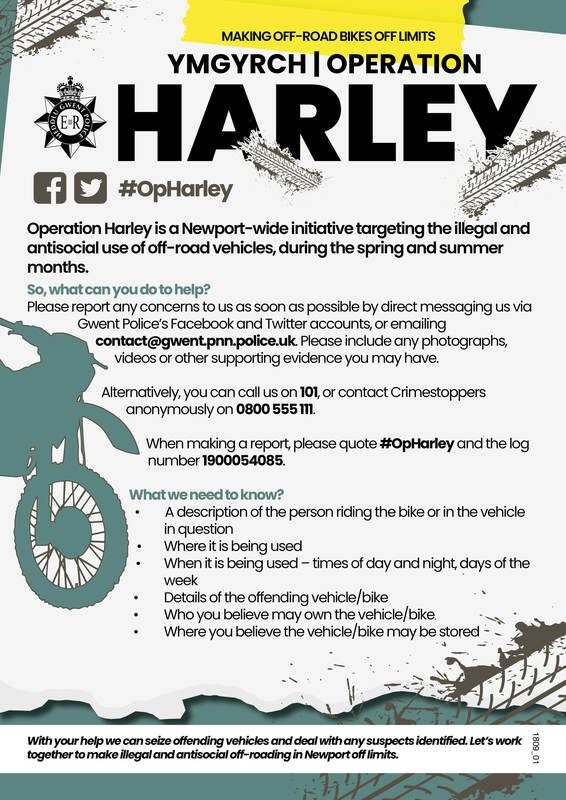 Gwent Police are running an operation to combat nuisance from off-road motorbikes. They're asking for information from the public about where and when the bikes are causing a nuisance. See this leaflet for details. where you can report potholes, fly-tipping, etc.